To Sum It Up: Moving on with her life after the death of her mother isn’t easy for Wen Guiren, not when she often assists her father, a physician in a slaughterhouse. The place is also allegedly haunted by a ghost who grants wishes, and Wen discovers the truth of this firsthand when a young worker who publicly humiliated her is badly injured following Wen’s offering to the ghost. Wen seems to have the ghost’s attention, but that may not be in her best interest as the number of seemingly unexplained—and alarming—events around the slaughterhouse rises. 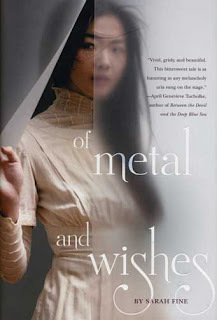 Review: Of Metal and Wishes is one of the most unique books I’ve read in a while, which may sound like a bit of an odd thing to say when you also consider that this novel is based on The Phantom of the Opera. I haven’t read the latter, and the extent of my knowledge of the story is limited to watching part of the 25th anniversary production of the musical version on TV. Not being entirely familiar with the original Phantom, in literary or musical form, didn’t keep me from appreciating the complexity of Sarah Fine’s Ghost, though. This character is simultaneously frightening and sympathetic, and I’ll return to gushing about how much I loved this plotline shortly. 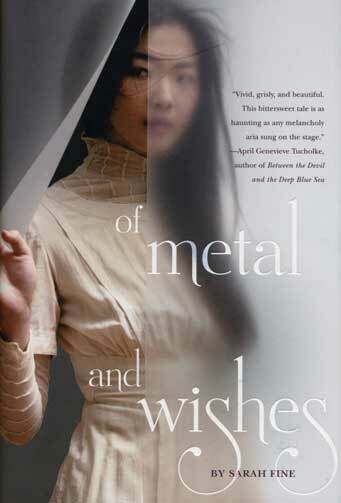 Of Metal and Wishes is set in a refreshingly different world that draws on Asian culture for some of its elements. Fine cleverly keeps you guessing as to what time period you find yourself in. It’s not quite modern, yet it’s not that far in the past, plus there’s a hint of steampunk to it, AND all of this centers around a slaughterhouse. That last bit alone lends the book an eerie atmosphere, and that’s before you even factor in the rumors among the workers that it’s haunted. Ah, the Ghost. Benevolent or malevolent? That’s the question you’ll keep asking yourself as his story unfolds. While he’s actually only a part of a larger mosaic, the Ghost was the character who drove the novel for me. I wanted to know everything about him, even when I suspected that the truth would be chilling. Wen, the protagonist, was my main reason for feeling disconnected from the book at times. I just never clicked with her narrative voice, and I found her a little immature on occasion, too. She’s self-aware enough to realize that she has some growing up to do, though, which kept me from getting annoyed with her whenever I felt she sounded kind of whiny. I also have to say that I didn’t find Melik, a slaughterhouse worker from a social class that’s looked down upon by Wen’s fellow Itanyai, especially memorable, either. I liked how Melik spoke his mind and looked after his fellow Noor, but as with Wen, forming a connection with him eluded me. It’s not that both aren’t well written characters because they are; it’s just . . . me. I loved Sarah Fine’s debut, Sanctum, and her prose continues to impress me with Of Metal and Wishes. She’s also created a world that you don’t come across every day in YA. Although Wen was an average main character, the Ghost’s compelling story still made this book very much worth a read for me. All in All: If you’re looking for a very different YA read, give Of Metal and Wishes a try. I had an issue here and there with Wen, but the Ghost bits were delightfully creepy.